I am just an ordinary man possessing no shining talents. Anything I have achieved I owe to my capacity for hard work and never giving up. He also developed an excellent memory for detail. Tojo graduated from the Japanese military academy in 1905 as a cavalryman, too late for meaningful service during the Russo-Japanese War. His father, by then an officer, fought in the war but returned to Japan with a severe case of beri-beri. This was an ominous reflection of the Japanese Army's weakness in logistics, which would again become evident during the Pacific War. In 1909 Tojo married Ito Katsu, the daughter of a minor politician. Katsu was a college student at a time when this was extremely unusual for Japanese women, and the marriage was also unusual for being in accord with the romantic interests of the couple, rather than being arranged by their parents. The marriage eventually produced seven children. Tojo graduated from the Army Staff College in 1915, where he achieved high grades; studied in Germany; and spent most of his career in staff positions. His return from Germany was via the United States, and Tojo was unimpressed with what he regarded as American decadence. Together with Nagata Tetsuzan, Okamura Yasuji, and Obata Toshishiro, Tojo helped organize an informal study group of field-grade officers in May 1929 that became the One Evening Society. The other three officers had served as military attachés in Europe and were impressed with Ludendorf's philosophy of total war, and the One Evening Society subverted the admissions process to the Staff College to reduce the influence of the conservative Choshu clan. Yoshihashi Tokehiko claimed in his book, Conspiracy at Mukden, that Tojo assisted Nagata in planning an abortive coup in March 1932. However, Tojo was never conclusively linked to any of the Army conspiracies of the 1930s. Tojo rose to prominent within the Control Faction at about this time. The Army had split into the Control Faction (Tōseiha) and the Imperial Way Faction (Kōdōha) in the 1920s. The Imperial Way Faction was composed of admirers of former Army war minister Araki Sadao, such as Yamashita Tomoyuki, who emphasized fighting spirit and denigrated economic factors in warfare. The Imperial Way Faction also promoted Emperor worship and called for an Army revolution to overthrow the civilian government. The Control Faction arose as a reaction against the Imperial Way Faction, and advocated economic planning in cooperation with the civilian government and the zaibatsu (large family corporations) to prepare Japan for a prolonged total war. Rise to power. 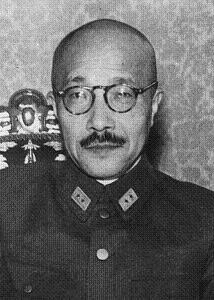 Tojo was head of the Kempeitai in Manchuria from 1935 to 1937, where he made his reputation by effectively transforming the Kempeitai into the arm of a police state. During the Tokyo mutiny of February 1936, which was largely the work of the Imperial Way Faction, Tojo moved swiftly to round up both soldiers and civilians in Manchuria who might be sympathetic to the coup, though he told his wife privately that he was moved by the tragedy that such men should be driven to rebellion. Regarded by his superiors thereafter as a completely reliable and apolitical solider, he was then appointed chief of staff of the Kwantung Army. In this capacity, he ordered 1 Division to drive the Russians from the disputed Kanchatzu Island on the Amur, but had his orders overruled by Army General Staff. Tojo, like most of the officers of the Japanese Army, considered Russia to be the principle threat to Japan, but believed that confronting Russia with a still-hostile China to the rear of the Japanese Army in Manchuria was "asking for trouble" (quoted by Peattie et al. 2011). Tojo's only combat experience came in directing operations in Chahar in August 1937, shortly following the Marco Polo Bridge incident. He had decided by this time that Chiang must be eliminated before Japan could go to war with Russia. On his own initiative, Tojo led a force of two brigades that outflanked the Chinese defenders in the Peiping area and secured the whole of Inner Mongolia, after which Tojo returned to Kwantung Army headquarters to prepare for any Soviet intervention. The operation was apparently carried out with "textbook precision" (Browne 1967), but the textbook called for an unimaginative use of tanks in an infantry support role that so frustrated the armor commander, Sakai Koji, that Tojo had him relieved for insubordination. Japanese tank doctrine would not be reconsidered until after the Nomonhon defeat in 1939 and the German victories in Europe in 1939-1940. In 1938 Tojo became vice-minister of war, serving under his old friend Itagaki Seishiro, but his ultra-nationalist attitude quickly became an embarrassment to Prime Minister Konoe. In November Tojo gave a speech to a group of industrialists in which he lashed out against the Chinese, the British, the Americans, and most especially the Russians, whom he predicted would soon be at war with Japan. He warned his audience against putting profit before war preparations, saying that "the Army would find means of seeing that they toed the line in the future" (Browne 1967.) The speech was widely reported in Japan and abroad, led to a sharp drop in the Tokyo stock exchange, and was sharply questioned in the Diet. In December Konoe saw to it that that Tojo was quietly reassigned to the nonpolitical post of inspector of army aviation. I make no concessions regarding withdrawal! It means defeat of Japan by the United States — a stain on the history of the Japanese Empire! Prime Minister. Faced with this intransigence, the Konoe cabinet fell, and Tojo was named to form a new cabinet and simultaneously promoted to full general. This symbolized the almost complete dominance of the Army over the civilian government. However, the Emperor and his advisers hoped that Tojo, who was known to be devoted to the Emperor, would respect his wishes to exhaust every possibility for a negotiated settlement with the United States. Marquis Kido, the Emperor's closest adviser, described this as dokuo motte kokuo seisu, "fighting poison with poison" (Hoyt 1993). Tojo initially took the portfolios of War Minister and Home Minister, the latter allegedly so that he could put down any unrest arising from a decision not to go to war. Though he seems to have held out hope of a peaceful settlement longer than most Army generals, he escalated tensions on 17 November 1941 in a speech to the Diet. He declared that no third power (an obvious reference to the United States) would be permitted in Japan's settlement of the China Incident. The speech was met with thunderous ovations by the members of the Diet, who New York Times correspondent Otto Tolischus described as "so belligerent that the government seems moderate by comparison" (Hoyt 1993). After war broke out, Tojo continued to gradually consolidate power. During the April 1942 elections, Tojo tried to pack the Diet with member of the Imperial Rule Assistance Association, but was not entirely successful. Many incumbents held seats that had been passed down from father to son, and Tojo felt compelled to support 235 incumbents along with 213 new candidates and 18 former Diet members. Tojo spent a colossal sum, about ¥2.3 million, bribing politicians and newspaper editors, and received an unexpected boost in the form of the Doolittle Raid just 12 days before the election. The raid created considerable pro-government sentiment, bringing 381 of Tojo's candidates into office and persuading 98% of the Diet to join the Imperial Rule Assistance Political Association when it assembled in May. We must, therefore, be prepared for difficulties of various sorts which may arise in the future, and that the present war will become a prolonged one. Accordingly this war remains indeed to be fought hereafter. In order to fulfill the purpose of the war, the whole nation must persevere, in whatever difficulties and tribulations with a firm conviction of ultimate victory and thus serve the country. Tojo spelled out what those war aims were: The establishment of the Greater East Asia Co-Prosperity Sphere, which he saw becoming a sort of United States of Asia. Tojo seems to have been sincere in his support for this pan-Asian vision, but the behavior of the Japanese Army in the occupied territories would spoil what might otherwise have been a great political opportunity. Furthermore, Tojo found himself increasingly at odds with his own Foreign Minister, Togo Shigenori. [He] labored mightily at advertising the initial successes of the war but was guilty of flagrant nonfeasance in carrying out urgently needed moves for increasing fighting power. Under such a premier ultimate victory in the war was not to be hoped for. By the end of 1942 Tojo was dictating Japan's grand strategy in a war that was turning increasingly against the Japanese. On 31 December 1942 Tojo presided over a conference of Imperial General Headquarters held in the presence of the Emperor. Tojo chose this venue to reduce the influence of Sugiyama Gen, the Army chief of staff, with whom Tojo was then struggling for control of the Army. Tojo already had the full support of the Navy Minster, Shimada Shigetaro, and for an hour and forty minutes Tojo dictated future strategy. Guadalcanal and Buna would be abandoned and a new defensive line would be held north of New Georgia in the Solomons. Meanwhile Japanese positions in New Guinea would be reinforced and a new drive launched against Port Moresby. The resulting Wau offensive was turned back by the Australians. Basically, it was lack of coordination. When the prime minister, to whom is entrusted the destiny of the country, lacks the authority to participate in supreme decisions, it is not likely that the country will win a war. Though self-serving, there is a kernel of truth in this statement. When Tojo tried to concentrate power in his own hands, he was opposed by colleagues who pointed out that many of Germany's setbacks came from Hitler's micromanagement. Tojo replied, "Führer Hitler was an enlisted man. I am a general." Nevertheless, Tojo never exercised effective authority. Tojo continued trying to consolidate his power, taking the portfolios of minister of education in April 1943 and of munitions in November 1943. This was viewed with growing suspicion by other Japanese leaders, including the Emperor himself, who in June 1943 elevated Terauchi and Sugiyama to the rank of field marshal while ignoring Tojo. However, the Emperor was inclined to blame Sugiyama and the Navy Minister, Shimada Shigetaro, for the reverses in the fortunes of the war, and the Emperor's displeasure with Sugiyama gave Tojo the wedge he needed to remove Sugiyama as Army Chief of Staff. Tojo then appointed himself to this position, on 20 February 1944. With this move, Tojo badly overreached. For the same man to serve as both War Minister and Army Chief of Staff appeared to be a violation of the Meiji Constitution. It also left Tojo with no one else to blame for the increasingly unfavorable course the war was taking. In April 1944 Prince Konoe approached Prince Higashikuni and Prince Kaya to seek their assistance in persuading the Emperor to oust Tojo. Their efforts began to bear fruit following the fall of Saipan, when many Japanese leaders concluded that the war was lost. Tojo came under intense pressure from the jushin or Privy Council, the council of elder statesman that included all former prime ministers and which advised the Emperor on such important matters as cabinet appointments. He also lost the support of key members of his own cabinet, such as the Foreign Minister, Shigemitsu Mamoru. Tojo was forced to resign, and he retired from the Army on 20 July 1944. Had Tojo remained in office, he may well have fallen victim to an assassination plot that day. Major Tsunoda Tomoshige, who had served in China under command of the Emperor's youngest brother, Prince Mikasa, planned to deliver a bomb laced with potassium cyanide to Tojo's office. Following Tojo's resignation as Prime Minister in July 1944, he should customarily have been invited to join the jushin. The Emperor did not make such an invitation until February 1945, which had the appearance of a calculated insult. When the Koiso cabinet fell in April 1945, Tojo tried to bully the jushin, warning of the Army's ability to make or break any cabinet and demanding that the council take upon itself the decision whether to seek peace. Frank (1999) suggests that Tojo was acting as an agent provocateur to expose anyone in favor of ending the war so that they could be marked for assassination. Tojo tried to get Hata Shunroku appointed as Prime Minister, repeating the now-familiar threat by the Army to refuse to name a War Minister if it did not get its way. He was rebuffed by Admiral Okada, who asked if the Army was serious about refusing to do its duties under a Prime Minister appointed by the Emperor. The rejection of Hata marked a decisive decline in the Army's control of the government. Accused War Criminal. Tojo unsuccessfully attempted suicide when occupation authorities arrived at his home to arrest him on 11 September 1945. He had apparently been preparing for suicide for some time, but was persuaded by Shimomura Sadamu, the new War Minister, to wait long enough take responsibility for the war and thus possibly spare the Emperor. However, Tojo had had a neighbor physician mark the location of his heart with writing ink, and the sudden arrival of American military police to arrest him prompted him to act. Contrary to later speculation, his attempt seems to have been completely serious; Tojo was left-handed, and attempting to shoot himself in the left side with his left hand spoiled his aim. The bullet barely missed his heart, and it was only with prompt and expert care by American military doctors that his life was saved. Tojo soon became a convenient scapegoat, becoming "Idiot Tojo" to much of the Japanese public and being satirized in the Tokyo theater. Rumors of corruption and consorting with geisha (almost certainly untrue) began to spread. He was well enough to be transferred to Sugamo Prison on 8 December 1945, and his trial (and that of the other Class A defendants) began on 3 May 1946. Tojo maintained his dignity throughout the proceedings, which he seemed to regard as a charade, and made a favorable contrast with the chief prosecutor, Joseph Keenan, who was frankly out of his depth. Though the trial was public, few Japanese citizens bothered to attend until Tojo took the stand. Tojo argued that the war had been forced on Japan, and claimed that the treatment of Allied prisoners of war was no worse than the Japanese soldier was accustomed to as his normal routine. It seems impossible that Tojo did not know the reality of Japanese mistreatment of prisoners of war. However, by the time he finished testifying, Japanese public opinion had once again become sympathetic towards him. Nevertheless, he was convicted of crimes against peace, crimes against humanity, and war crimes and sentenced to death on 11 November 1948. He subsequently publicly accepted responsibility for mistreatment of prisoners of war, possibly in a final effort to shield the Emperor. He was hanged on 23 December 1948. ... one of the few Army officers with whom I failed to establish any relations other than formal. On the occasion of my first interview it was obvious ... that he regarded most foreigners with some suspicion, if not dislike. General Tojo gave me the impression of a strong man badly disillusioned, who intended to pursue his path unhindered by any interest other than Japanese; he never showed any sign of sociability. Tojo was an intense nationalist, "sincere" in the peculiar sense understood by the Japanese. His nickname, "Razor Brain" or "The Razor", (Kamisori), referred to his bureaucratic ruthlessness rather than his intellectual capacity. He was essentially a narrow-minded bureaucrat with no real understanding of the immense military potential of the United States.